and he will try to help you personally. Thanks Mike! All information is as accurate as we can make it at this point in time, but mistakes do occur, for which we welcome your corrections, questions, suggestions, and updated information. Our goal is to continue to make these web pages interesting and accurate a portrayal of this line of Brimers as we can. 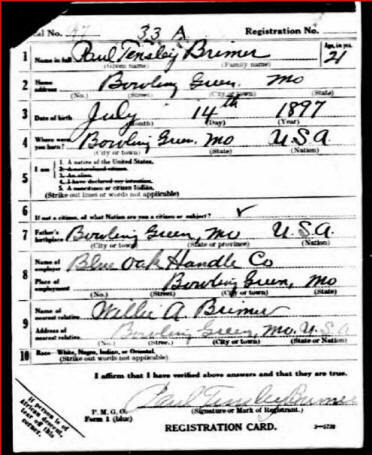 1897 July 14: Paul Tinsley Brimer born in Bowling Green, Pike County, MO. 1899 Jan: Paul's future wife, Darlene Daniel is born in Pike County MO. 1920 Feb 18: Married Abbie Darlene Daniel in Pike County, MO. Darlene was born 3 Jan 1899. Darlene died 20 May 1991 in Bowling Green. Had 4 children together. They would ultimately divorce. 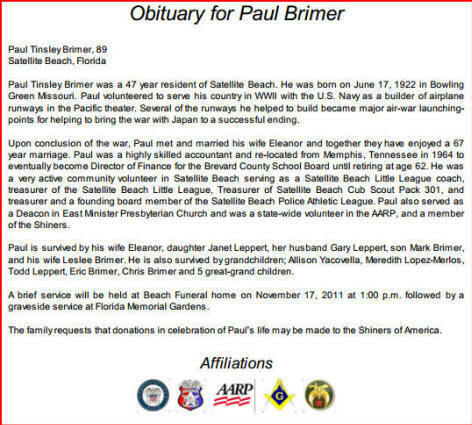 Their children were: Paul Tinsley Brimer, Jr., Allison Reynolds Brimer (1924), Peggy Brimer (1928), Roy Carrol Brimer (1932) . 1922 June 17: Son Paul Tinsley "Junior" Brimer, Jr. born in MO. As his father was, so was Junior a member of the Masons. 1924 April 9: Son Allison Reynolds "Bubby" Brimer born in Bowling Green, Pike Co., MO. Allison would live until 20 April 2009 when he passed away in Tehachapi, Kern Co., CA. Bubby received his high school diploma and went on to several types of work over the years. Right after school he joined the Na vy but was given a discharge for medical reasons during his basic training. This led him to becoming an electrician building cargo ships in the shipyards of Los Angeles. At the end of WWII on April 15th 1945 in Los Angeles he married Martha Jean VANCE, who was born in Little Rock, AR on August 30 1925. When jobs were hard to find after the war, he accepted work as a press man for a cleaners and a cook on the Fleischman yacht which traveled to and from Alaska. Back on land again, he became a financial manager for a china/dinnerware manufacturer and then a finance manager for a furniture store. Martha J. and Allison R. had two sons during their marriage. Although he married twice more, he did not have other children. After his finance management positions, he began his banking career at a Southern California bank where he completed several American Bankers Association and American Institute of Banking courses. His banking career field led him to become a vice president for three private banks over a period of years. The FDIC hired him to become a bank audit team leader for the Colorado region. 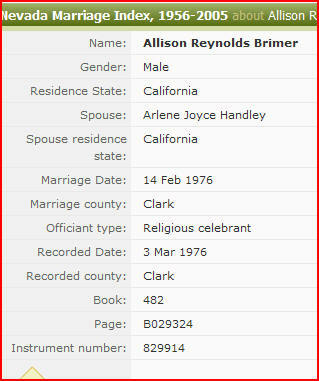 During his lifetime, Allison was married three times. Martha Jean Vance and he divorced sometime around 1972. 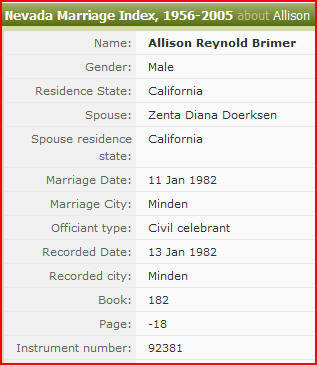 There are two listings for Nevada marriages of Allison: one to an Arlene Handley in 1976 and one to a Zenta Diana Doerksen in 1982. He was a Baptist. 1928 June 6: Daughter Peggy Brimer was born. She died New Year's Eve, 1991 in MO. It is believed she married a FNU Diesel. 1932 July 12: Son Roy Carroll Brimer was born. 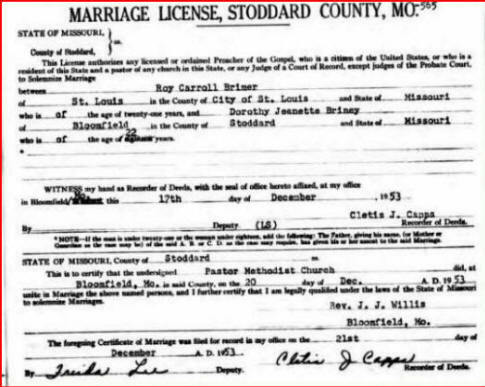 Roy married Dorothy Jeanette Briney in MO in 1953. He died in MO on July 26, 2008. More information below in his obituary. 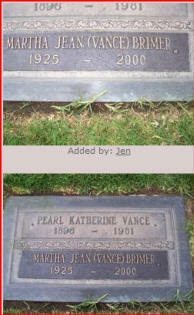 From findagrave; obituary: Friday, August 22, 2008 in the Daily Statesman. Roy C . Brimer, 76, a long time resident of Reisterstown died peacefully on July 24, 2008, at Northwest Medical Center. He is survived by his son, Richard Brimer of Austin, Texas; Rebecca Quoos of Jacksonville, Florida; and seven grandchildren. He was preceded in death by his wife, Dorothy Jeannette Briney Brimer in June 2000. Mr. Brimer spent his career in the Defense Industry retiring after 17 years at Westinghouse. His assignments took him throughout the United States, including Connecticut, California, Maryland, and Iran. He was also an accomplished pilot, serving as a flight instructor in California, Texas, and Iran. His hobbies included coin and gun collecting. 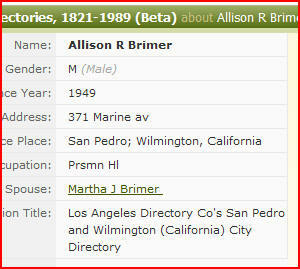 In his later years, Mr. Brimer became an active member of the Masons. He avidly recruited new members and led drives to collect reading material for our troops serving in Iran and Afghanistan. After his retirement, he traveled extensively to Alaska, Africa, China, and other exotic locales. He met Dorothy Jeannette Briney while they were attending the University of Missouri in Columbia. They were married in 1953 in the bride's hometown of Bloomfield. Memorial gifts may be given to the Warren Lodge of the Freemasons to support their charitable activities. A memorial service will be held on Saturday, August 23, 2008. at 10 a.m. at the Trinity United Methodist Church in Bloomfield with Rev. Susan Hoyle officiating. Interment will follow in the Bloomfield Cemetery. Date unknown: Divorced Abbie Darlene Daniel Brimer. During WWII: Paul Tinsley Brimer (Sr.) moved to the Seattle area where he helped make cargo ships. 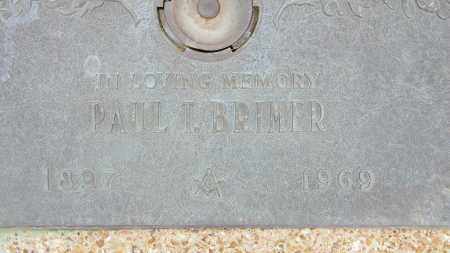 After WWII: Paul Tinsley Brimer (Sr.) moved to the Cedar Rapids area to live near his brothers. He was a pipefitter and worked for a local power company. 1946 Oct 13: Paul Tinsley Brimer (Sr.) married (2) Ethelyn Lenore Keagle, Austin, Mower Co., MN. Ethelyn was born 7 September 1913 in Collins, Story County, Iowa. Her parents were George Harrison Keagle and her mother was Laura Marsh Keagle. She graduated from Collins High School. Ethelyn was a telephone switchboard operation, a homemaker, and a nurse's aide. She was born in Iowa and ultimately moved to Arkansas with her husband P aul Sr. She was a Methodist, then Presbyterian. They had no known children together. 1969 July 6: Paul Tinsley Brimer Sr. , a Mason, died of a stroke in Arkansas and is buried at Baxter Gardens in Mountain Home, AR. During his life he was a journeyman pipefitter. And he enjoyed hunting and fishing. He was Presbyterian. 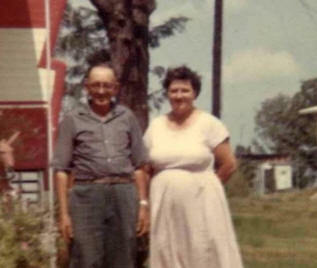 After 1969: Sometime after Paul Sr.'s death, Ethelyn Deagle Brimer returned to Iowa to be near family. 1991 May 20: Abbie Darlene Daniel Brimer died at the age of 92 in Pike County; she she had returned to Bowling Green MO after she retired. Please share information.... Questions? Comments? Copyright �2011-2016. All Rights Reserved. Great effort has been taken for accuracy of information although this cannot be guaranteed. Click here to send mail to Donna and Patrick Cator with questions or comments.